Blackpool Pleasure Beach are inviting all guests to arrive in their creepiest and scariest costumes all day Saturday with competitions for best costumes for children and adults! They're also giving your favourite characters a monstrous makeover, too! From 4.00pm the park will transform into a ghastly and spine-chilling place where hordes of zombies and vampires have broken free from their prison in the catacombs of Blackpool Pleasure Beach and can be found roaming the park in search for victims. Keep your wits about you for the towering shadows of the stilt walking fire eaters making their way around park. Live bands will also be playing from 4.00pm in the FY4 area around the spooktacular Dancing Fountains! Looking for an extra frightening experience? Try to find your way through the Horror Maze where gruesome guys and ghouls are around every corner. All of this and a hair-raising evening of Late Night Riding and spectacular display of fireworks at 10.00pm. If you attend in fancy dress, adults receive a free alcoholic Vampire Blood Slush Cocktail* and children receive a non-alcoholic Vampire Blood Slush Cocktail, and more in Nickelodeon Land! ALL WRISTBANDS £22.00 when booked online in advance. Wristbands £22 at Ticket Centre on the evening. All this for just £39.00!! 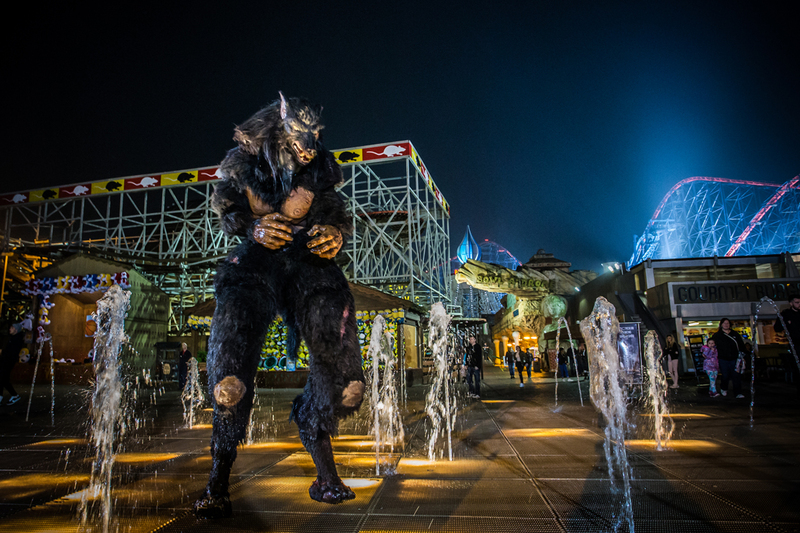 For a TRULY TERRIFYING HALLOWEEN, Blackpool Pleasure Beach's Fright Night packages provide all the thrills, screams and shrieks you could ever want. This ghoulish package includes a wristband to enter the park, a horrifying trip through the interactive horror experience, Pasaje Del Terror and a ticket for the delightfully grisly Circus of Horrors. A blend of Rock, Horror and Mayhem! The UK’s darkest circus returns for a night of spooks and spectacles! After taking to the road over 22 years ago and touring all over the world the phenomenon returns with its latest brand new incarnation “VOODOO”. Warning: The Circus of Horrors contains content of an adult nature, it is not suitable for children.Recommended age 16+. Well, Blackpool Pleasure Beach has got both! Head on down to Nickelodeon Land each Saturday and Sunday during Halloween Half term and of course Halloween Monday 30th October for some Trick or Treating fun! Feeling spooky? Guests in fancy dress can Trick or Treat with Team Nick! Plus, SpongeBob and Patrick have dressed up for Halloween, so head down to Nickelodeon Land for some Trick or Treating fun! Every day throughout the ten days of October half term at 1pm and 3pm experience Creepy Hollow at Planet Rock for educational and interactive workshops! Get close-up with stick insects, cockroaches, giant snails, a snake, a lizard, a tenrec (Madagascan hedgehog), and various weird and wonderful artefacts! You can’t have Halloween without pumpkin carving, so Blackpool Pleasure Beach will have a professional pumpkin carver on Friday 27th October, Saturday 28th October and Sunday 29th October in the Sculpture Gardens! Forgot to do your makeup? If you want to join in the fearsome fun while at Pleasure Beach, you can also find one of Blackpool Pleasure Beach's freaky face painters who can give you a terribly good makeover! Look out for scarecrows, pumpkins and abandoned coffins . . . or are they abandoned? Be very aware of some unwelcome visitors locked behind closed doors! The question is, can the doors hold them? While you are visiting, watch for Lougarock the Werewolf and the terrifying curse of Scepticemus! Keep an eye out for these creepy visitors as you never know where they might turn up! Book your tickets to Vampire Pleasure Beach at Blackpool Pleasure Beach and Nickelodeon Land now at blackpoolpleasurebeach.com! More Nick: Nickelodeon UK To Premiere SLIMEFEST 2017 Highlights Special On Friday 3rd November 2017! Follow NickALive! on Twitter, Tumblr, Google+, via RSS, on Instagram, and/or Facebook for the latest Halloween at Nickelodeon Land UK News and Highlights!